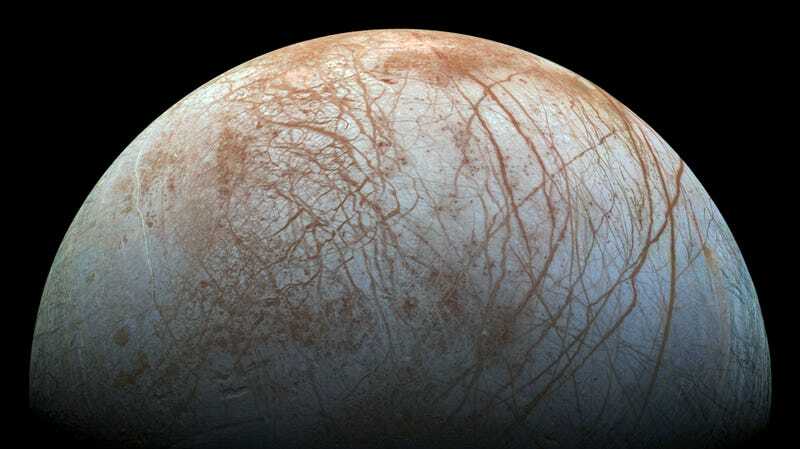 Jupiter’s moon Europa, with its subsurface ocean, may have what it takes to foster alien life. A mission to this icy moon is on the wishlist of many astronomers, but new research suggests it won’t be easy to land spacecraft there: Its surface seems to be littered with icy spikes, the tallest of which measure five stories high. New research published this week in Nature Geoscience suggests Europa’s surface is covered with tall, sharp-edged icy blades known as penitentes (pronounced PEN-E-TENT-EES). If you’re a geologist, that’s a super cool discovery; but if you’re an astrobiologist, it’s a major bummer. That’s because Europa, like Saturn’s moon Enceladus, features a vast subsurface ocean that could serve as a potential habitat for extraterrestrial life. The presence of the penitentes—some reaching 50 feet into the sky—could “pose a hazard to a future lander on Europa,” the researchers write in the new study. Penitentes are composed of snow and ice, and they arise through sublimation—a chemical process in which ice turns directly into water vapor without melting into a liquid beforehand. The remnants of this process are the penitentes themselves, which always point towards the midday sun. To form, these icy spikes require bright sustained sunlight, and also cold, dry, still air. Small penitentes in Chile’s Atacama Desert. On Europa, these structures are much larger, reaching upwards of 50 feet in height, according to new research. We’ve got penitentes here on Earth, but they’re only found in high-altitude regions near the tropics, such as the Andes, and they range in size from about 3 to 16 feet. The conditions on Europa are considerably better for penitente formation, as the authors of the new study, led by Daniel Hobley from Cardiff University, point out. Those conditions include a surface covered in ice, ideal temperatures, and other environmental factors to support sublimation, and a consistent angle of incoming sunlight. To date, the resolution of photographs taken of Europa’s surface hasn’t been fine enough to show the penitentes, so they remain hypothetical. That said, computer models run by Hobley and his colleagues strongly support their presence. Using pre-existing observational data, the researchers calculated the sublimation rates at various points on the moon’s surface, allowing them to estimate both the size and distribution of the penitentes. According to the models, Europa’s penitentes are capable of growing to around 50 feet tall (15 meters), with a spacing of about 25 feet (7.5 meters) between each one. The icy spikes are likely to be more common around Europa’s equatorial regions, according to the study. If there is some good news in all of this, it’s that a future mission to Europa might avoid the equatorial regions anyway. Research published this past July suggests scientists on the hunt for life will have a better chance of finding potential biosignatures in Europa’s younger ice and in lower-radiation locations. This type of ice, which is less than 10 million years old, should exist in the mid-to-high latitudes, where the moon points away from Jupiter. And as the new study shows, these areas are less likely to host those hazardous icy spikes. Further observations are needed to definitively prove that Europa’s surface is covered in the penitentes, but that could come soon. NASA’s Europa Clipper spacecraft is scheduled to launch at some point between 2022 and 2025. This orbital probe is packed with instruments, and it’ll come to as close as 16 miles (25 kilometers) to Europa’s surface. Excitingly, the Europa Clipper mission may be a forerunner to a landing mission on the Jovian moon, in which a probe would drill through the icy surface and plunge into the dark ocean beneath. The technical requirements of such a mission boggle the mind, and now, with the news that Europa’s surface may contain vast fields of penitentes, there’s an added complication. But as it’s often said, space is hard. And as we continue to push the envelope, it’ll only continue to get harder.